Check out a cool online horse game this christmas. Utterly Horses are giving away one of the new Schleich Ravenwood Giftsets! To enter, just fill in your email address below and like our page on Facebook. There are other options to increase your chances of winning too. Its as easy as that! This is a fantastic starter ser for the new collector as it contains everything you would ever want or need! It includes everything in the picture- stable, horse, and accessories. The roof section of the stable can also be removed to create an additional building in your stableyard! The competition closes on the 30th September 2014 at 12noon. The winner will be contacted via email. Please click the following link to enter this amazing competition! Today I have updated the HorseIsle UTS Calculator tool in a couple of different ways, firstly there was a value error in the Hackney Horse which has been rectified. In addition to this change, I have also added the following breeds to the HorseIsle UTS calculator tool. During February HorseIsle added the Maremmano horse breed to their game, I have updated the HorseIsle UTS calculator tool to include this new breed of horse so you can quickly calculate the UTS of any horse on HorseIsle. Today I have added the Franches Montagne to the HorseIsle UTS calculator tool. Its the most recent breed added to the HorseIsle games. I hope you will find it most useful! The reason why there have not been many updates, is because I have been hard at work designing and creating a brand new design for EbonyGraphix which should be ready for release early 2014. This design will be very easy to use and there will be a lot of new content including new layouts, tools, information and designs. Well I has been a very long time since I have updated EbonyGraphix, I have recently been very unwell and unable to keep on-top-of the site, but now im back and better than ever. Today I have updated the HorseIsle UTS Calculator and it now includes the following new breeds that have been added to HorseIsle over the past few months. I hope that you will take full advantage of the fully updated HorseIsle UTS Calculator and be sure to tell your friends about this site! Today I have added the recently added Westphalian to the HorseIsle UTS Calculator tool. I hope that you will find this update very useful. It was brought to my attention that the HorseIsle UTS Calculator tool was bringing back incorrect UTS for the Gypsy Vanner. This has now been updated and the issue has now been resolved. Thank you everyone who brought this issue to my attention and I am glad that many of you find this feature very useful. Today I have added the Mangalarga Marchador breed to the HorseIsle UTS Calculator tool. I know that it has been on HorseIsle since earlier this month however I have had a lot on and was unable to add it until now. You can quickly access the "HorseIsle UTS Calculator Tool" from the navigation menu at anytime you wish. I hope you will find this update very useful. Today I have added my own personal review of game The Sims 3: Pets. The game now includes horses and its a really amazing game to play! "Horse Games & Help" in the menu and click on "PC Horse Games". Horse breed info: Arabian is listed under "News & Information". I do plan on adding more but it takes time. As you may have noticed the navigation menu has now been updated with the most popular pages on EbonyGraphix giving you faster navigation and hopefully making everything easier to find. If you cant find a page you are looking for simply click on "SiteMap" and you will see all the pages on EbonyGraphix which are all just two clicks away. I have noticed that several users wish to support EbonyGraphix and help keep it online by donating via PayPal this option has always been available on the bottom of each players however I have made it more accessible by adding a "Donate" button on the top right of every page. If you wish to support ebonygraphix and help keep the site online (as its not free for me to keep it online due to hosting charges etc) you can choose how much you wish to donate via PayPal, Debit/Credit card by clicking the "Donate" button. In the near future I plan on making EbonyGraphix much more informative and will provide a lot more information on new and upcoming horse games, and I also plan on adding a lot more diversity in the layouts themselves. I know that there have not been many new layouts added in the past few months, this is due to work commitment (EbonyGraphix is not work, its a hobby). And due to that EbonyGraphix had taken a back seat in the list of personal priorities. I do plan on updating the personal layout generator area and modernizing of the overall site design. If you already have a membership account you will still be able to make unlimited number of personal layouts through the generator until your membership expires. However I plan on allowing everyone to make personal layouts however the only way to get the code is if you buy it for a reasonable price of approx. £1.50 - £2.50 GBP. So you can see exactly what you are getting before purchase. If you have any suggestions for content or layouts that you would like to see Ebonygraphix please feel free to contact me. Today I have updated the HorseIsle UTS Calculator tool to include the two newest breeds to be brought to HorseIsle. Enjoy! New Breeds Added to HorseIsle, HorseIsle UTS Tool and MyStable! MyStable has recently updated their game to include an amazing breed to the game, the breed is known as the Italian Heavy Draft and is a true delight to actually see in the flesh. First developed in the 1880s the Italian heavy draft horse comes in three colours, primarily chestnut but does come in roan and bay. Standing between 14 and 15 hands high its a quality type of draft horse. Additional to this they have also added 9 new crossbreed combinations for players to discover and enjoy! If you do not play MyStable check it out at www.mystable.co.uk. You can view and use the HorseIsle UTS Calculator tool by clicking here. It has been a long time coming, I am happy to announce the release of a brand new horse layout, known to the world as Silence of the Pony! 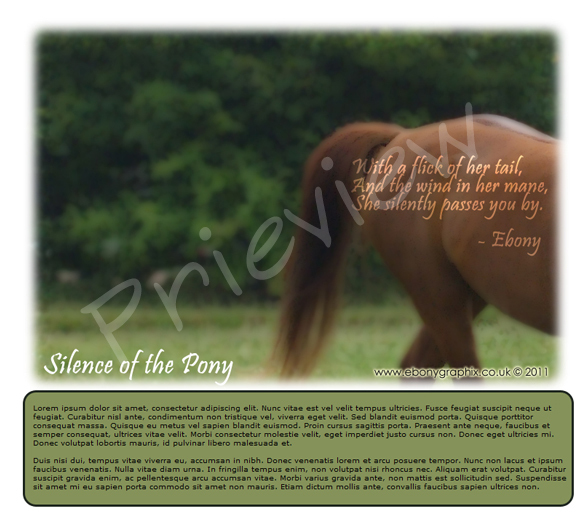 It is a cute little layout with a chestnut pony just scooting out of the shot, and a lovely poem to go with it. You can find the new layout at the top of the free layout section. Here is a preview. I would love to hear any feedback you have about the layouts and what you want to see next! Recently HorseIsle have added another new breed to their game known as the Kerry Bog Pony. I have updated the HorseIsle UTS Calculator tool to accommodate this new breed and for you to easily find out your new horses UTS. About a century and a half ago, the Kerry Bog Pony was a common sight in Ireland. It was the small farmers draft horse and often used to haul peat for fires. Its numbers declined drastically when many Irish emigrated to the United States, and by the turn of the millennium only a very few were left in County Kerry. Recently, devotees of the breed have begun collecting feral ponies, identified as Kerry Bog Ponies both by conformation and unique genetic markers, and re-establishing the breed as an all-around riding and driving pony. Kerry Bog Ponies generally stand between 10 and 12hh and most are "hard" (dark) colors, though greys and duns also occur. After three days of the community of MyStable pulling together the curse of the demonic horse has been removed and the dark elf princess nuray was banished to the horse model from which she came. Today is the last day for entries into the MyStable.co.uk official horse model competition for halloween. If you claim your free gift from the Halloween event you get one free entry into the competition! The fabulous online horse game www.mystable.co.uk is currently having an awesome halloween event where all the horses have been turned into demonic equines by Nayla the Shadow Elf princess. The only way to turn all horses back to normal is for the MyStable community (the players of MyStable) to login and collect ingredients needed for a device which will turn the shadow elf princess into stone and all horses back to normal! You should NOT miss this massive event! HorseIsle have recently added the Mongolian Horse to their ace game. I have updated teh horseisle uts calculator tool to include the new breed! So please feel free to check it out. Here are some images of the new Mongolian Horse. Good news our server transfer is complete and we are back online! It has been a while since horseisle.com have updated their game, they have presented us with a brand new draft breed, a new companion, several new quests and more new jungle temples. The Russian Heavy Draft has 7 different colours and here is the bio on the breed as provided by HorseIsle. The Russian Heavy Draft is actually a product of the Ukraine. Although pony-sized, this is a powerful horse capable of remarkable traction. It derives from heavy horse and/or ponies native to the area, crossed with small individuals of French and Belgian draft breeds. Generally chestnut and often with a flaxen mane and tail, this little horse is beloved because in addition to being a good worker and economical to keep, it is a beautiful horse with fluid, pleasing gaits and a pleasant temperament. It generally stands around 14.2hh and is only found on the lava isles. The EbonyGraphix HorseIsle UTS calculator has been updated to include the new breed! So please enjoy it! Below are some images of the colour variations for the Russian Heavy Draft. Today I have made some tweaks and adjustments to the horse name generator due to some malicious individuals trying to ruin it for everyone else by entering inappropriate and indecent words into it. The horse name generator is designed and there to help people, and anyone found entering inappropriate content into it to upset other people will have the privilege of using this website removed from them. Yes it is possible and no I dont have a problem banning individuals who abuse it from using it. For the people that abuse it: YOU ABUSE IT YOU LOOSE IT. Simple! The wonderful online horse game www.mystable.co.uk has recently updated their great game by including the "Grade Horse". This basically means that any breed of horse can breed to any other on the game - just like in real life. Its a great addition simply because when you watch the FEI horse championships on television they actually say that many of the top end horses that are competing are mixed bred horses basically meaning "grade horses". Along with the new Grade horse they have also updated their breeding areas to support the new breed and a radical improvement to the search for stallions at the town breeding center has made it easier - much easier and straight forward to find those perfect stallions to breed your mare to. Be sure to check it out and if you have not already created a free account on the online horse game MyStable.co.uk you can create one using the link above. Recently HorseIsle have added a new breed to their game known as the Walkaloosa, I have updated the horse isle uts generator tool to include this new breed that is now live. 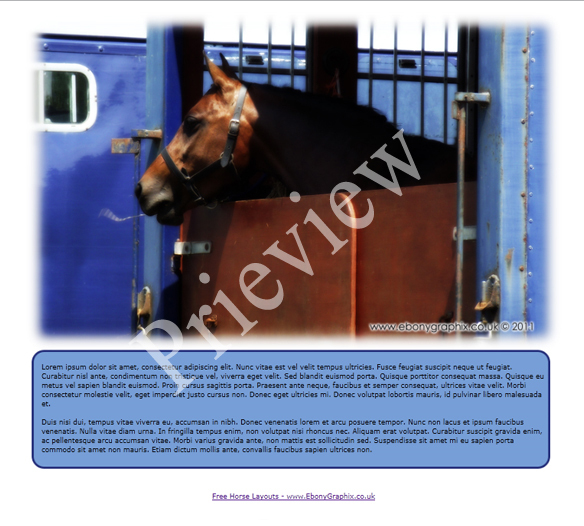 Today I have added another free pre-designed horse layout known as "Trailer Horse" It features a dashing bay horse in the back of a blue horse trailer. I hope you will like this new layout. Be sure to check it out by clicking on "Free Horse Layouts" on the top menu and give it a rating! On the 1st June 2011 HorseIsle1 has added the Iberian Warmblood to their great game. I have updated the horseIsle UTS calculator tool to include the iberian warmblood. 1. Click on "Click here to show navigation bar" located in the "Navigtion Section"
2. Click on "HorseIsle Help Section"
As you know on the 4th May horseIsle released a brand new breed to their game known as the Tersky. I have updated the HorseIsle UTS generator tool to include this new horseisle breed! Be sure to check it out! On the 8th April 2011 the online multiplayer online horse game "Riding Club Championship" has closed its servers and has ceased game play. This is a sad time as it was one of the best 3D PC/Online horse games out there. There is some good news - they plan on releasing their game on facebook however this could take many months to complete. We have some very sad and also some very exciting news. Firstly it is with real sadness that we announce the immediate closure of Riding Club Championships. 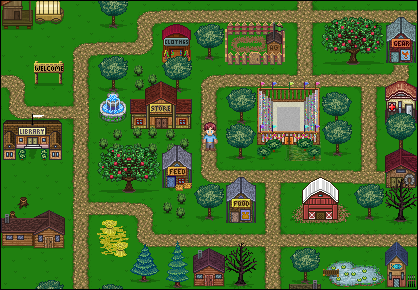 However, the exciting news is that we are developing and soon releasing a version for everyone to play on Facebook. It will still be the RCC that we all know and love, but a new beginning, with new challenges and a new layout. It will be, as you would expect, far better than the usual games you play on Facebook. We would like to say a massive thank you to ALL our members, old and new, its been a lot of fun, and we look forward to seeing you all in the new game very soon. Clicking on "Navigation" and clicking on "HorseIsle Help". Today I have updated the "Horseisle UTS Calculator Tool" to include the recently added "Irish Sport Horse" to HorseIsle. HorseIsle added the Irish Sport Horse on the 26th March 2011. Irish Sport Horse Added to HorseIsle. Do you have horse pictures? If you have taken pictures of your, or someone elses horses be sure to send them to our gallery! I can only accept images that have not been taken off websites for legal reasons and you never know your picture or horse may feature in one of our great free horse layouts! Simply click on HORSE PICTURES located on the top menu and send them to the email address on that page! Hope to see more great pictures submitted! Today I have added a review facility to the layout list page which will allow any visitor to leave one review of each of the layouts. Simply click on the number of stars that you want to give the layout! Simples! On the 20th February 2011 HorseIsle.com 1 added the long awaited Anglo-Arabian to their game. I have added this breed to the EbonyGraphix HorseIsle1 UTS calculator tool so its 100 upto date. You can access the HorseIsle UTS Calculator tool by clicking here or by clicking on "Navigation" and clicking on "HorseIsle Help". I have been working hard on updating EbonyGraphix. I am happy to inform that there is another brand new horse layout avaliable known as "Line Up". It features a line of horses, ponies and their riders in a show line up claiming their ribbons and trophies at a local Equine show. 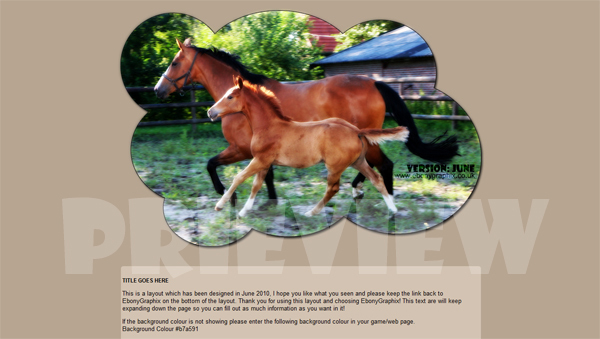 I hope you will check it out in the "Free Horse Layouts" section of the site. Along with the planned new free horse layout, I am working on re-building the personal layout generator. I will be making it in a way which will allow any user of the game to use however if you like what you see to get the code for the layout it must be purchased through either pay pal or hopefully other payment methods. Anyone with a paid for membership account will still be able to use it entirely for free which is the better and cheaper option as you get unlimited amount of personal layouts still with membership accounts. I am happy to say that in the next few days (hopefully tomorrow 9th February) another free horse layout will be made live here on EbonyGraphix.co.uk. The new layout is underway and under construction and will be made to the existing standards and style of EbonyGraphix layouts. Remember if you have any suggestions for future layouts I will be happy to listen to them, you can contact me at any time you wish through the contact form. You can access the contact page by clicking on "Contact & Help" tab on the top right of any EbonyGraphix page. Thanks for reading and be sure to check back in 24 hours! On the 28th January the HorseIsle1 staff have redesigned and updated the Quarter horse. Below are screenshots of the latest Quarter Horse designs and all colours. Now you can follow us on Twitter and Facebook at the click of a button. To follow us on twitter or Facebook simply click on the Facebook or twitter icon on the top right of any page. You will hear about any cool new layouts, features, and exciting news about online horse games and EbonyGraphix! Please check it out! If you are an avid player of HorseIsle 1 you will be aware they added a new breed to their game known as the Campolina. I have added the Campolina to the EbonyGraphix HorseIsle 1 UTS Calculator tool for people to use. If you would like to use the free HorseIsle UTS calculator tool please click on the "Navigation Icon" then click on "HorseIsle Help Section". The HorseIsle calculator tool is at the top of the page. "The Campolina is a gaited horse from Brazil. They were originally bred by Cassiano Campolina, a land-owner of great importance whose horses were especially admired by the Portuguese emperor. The breeds blood includes that of the Alter Real and the now extinct Spanish Jennet, as well as horses of Austrian origin. Campolinas are very popular and numerous in Brazil. They stand between 14 and 15hh and all colors are found in the breed." I hope you will enjoy this update and find it useful. 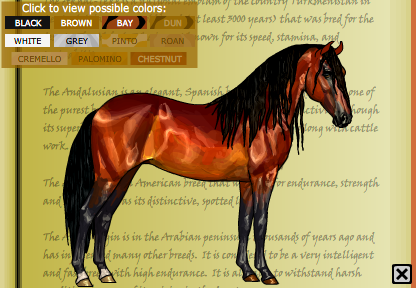 New layout: Roan Horse available. Today I am happy to announce that I have painstakingly created and enabled another brand new free horse layout for you to use for your own personal use. The latest layout is called "Roan Horse" and features a gorgeous roan horse which I spotted at a local horse show. The layout itself has an expanding text area which means the text area will keep getting larger the more content that you enter into your page. Be sure to check out the free horse layouts section for this brilliant and special new layout, the first of many to be added to EbonyGraphix for 2011. If you have any suggestions for layout ideas that you would like to see here please feel free to contact me through the contact page! Today I have updated the HorseIsle UTS Calculator Tool to calculate the UTS for the latest breed added to HorseIsle1 game known as the Ukrainian Saddle Horse. I hope that you will enjoy this update and find it useful. You can check out the "HorseIsle UTS Calculator" tool by clicking on the following link. I have been working extremely hard over the past few days to get a variety of new layouts completed and tested on the most common online horse games including, MyStable.co.uk, Horseland, Ponybox, Howrse and AVirtualHorse. The 20 new layouts are now avaliable for everyone to use if they so wish. There are 10 individual layouts however each layout has an expanding text box and scrolling text box variation. I have also clearly written on each of the layouts which websites will work with the layouts, I am planning on adding seperate sections for each of the popular horse games, and plan on writing a seperate scrolling layout variation for horseland users. This means that if the scrolling text box does not work on the web page you are trying to use it on... simply use the expanding text box variation and it will work perfectly. This is to help cater for users of games which dont have full CSS access on them. All other layouts have now been discontinued and throughout the next few months they will be removed from EbonyGraphix, simply because many of them no-longer work anymore on other online horse games such as Horseland who have messed up the layout making process. New Layouts Pending, HorseIsle UTS Tool Completed, Gallery Update. I have been working extensivly hard to produce some brand new layouts, they are all tried and tested for the online horse game known as MyStable, and so far do not work on Horseland since they do not allow standard CSS (even though they say on the update page that they do allow it - its a lie... i never did like horseland). When I have the first 10 brand new layouts avaliable I will be discontinuing the old layouts of EbonyGraphix and starting afresh, giving a new lease of life... hopefully by that time I will have a Standard HTML / CSS version (that works on MyStable) and also a Horseland variation which should work on horseland. Fingers crossed they are due for release at the end of the week... if not sooner. The following remaining breeds have been added to the HorseIsle UTS tool which means that every breed has been added to the tool allowing everyone to accuratly calculate their horses UTS. This also includes the latest breed the Argentine Polo Pony which was most recently added to HorseIsle game. Thus completing the HorseIsle UTS Tool. I hope you will enjoy this and find it useful for Horseisle you can view it on the "HorseIsle Help" page that you can access at any time by clicking on the "Red Navigation" icon then select "Horseisle Help" from the list. I have also updated the visitor gallery, it will now show random images from the gallery in no particular order each time you load the page giving the impression that the gallery is updating regulary. More appealing to the eye if you ask me. Today I have updated the "HorseIsle UTS Tool" to now include breeds A - P.
I hope you will enjoy this and find it useful for Horseisle you can view it on the "HorseIsle Help" page that you can access at any time by clicking on the "Red Navigation" icon then select "Horseisle Help" from the list. Today I have updated the "HorseIsle UTS Tool" to now include breeds A - H.
Today I have updated the "HorseIsle UTS Tool" to now include breeds A - K. As you know there are a lot of breeds on Horseisle and it will take some time for me to fill out the UTS tool so your patience is a blessing in this case. Today I have updated the HorseIsle UTS calculator to include all horse breeds from E to F. Each day this week I will be adding more daily so be sure to check it out when you can. Tomorrow I will be adding breeds from G - K.
Check out the HorseIsle UTS calculator tool at http://www.ebonygraphix.co.uk/help_horseislegame.asp Enjoy! I would like to announce that from now on I will be starting to replace the old horse layouts with new ones, the old versions will no longer be avaliable after they have been remade. I have also added a visual membership account recovery section which you can access through the bottom of any login page. This is useful if you have not yet recieved or have forgotten your login details. As times change, so do standards. Today the menu has been updated I have removed the Home button from the top and added direct links to "Free Horse Layouts", "Personal Layout Generator" and "Horse Gallery". Today EbonyGraphix has launched the return of its visitor gallery, we used to have one but many of those images have been lost when we moved to a new paid server. If you have taken any images of horses yourself please feel free to send them in to us. You can view our new gallery at www.ebonygraphix.co.uk/gallery.asp or click on the link to it located in our Navigtion bar! It came apparent that many people do not realize that there are lots more to EbonyGraphix than just horse layouts, there is a very in-depth help section for three of the most popular on line horse games, amazing tools to help you create your own layouts, horse name generator and much much more including video tutorials on how to draw horses, a great news blog and so much more than just layouts to offer! I have moved the navigation bar with the site map to the top of the site instead of the bottom of the site but to make sure it does not take up too much space on your screen you can minimize and maximize it by pressing the "Click here to hide navigation bar" and "Click here to show navigation bar". 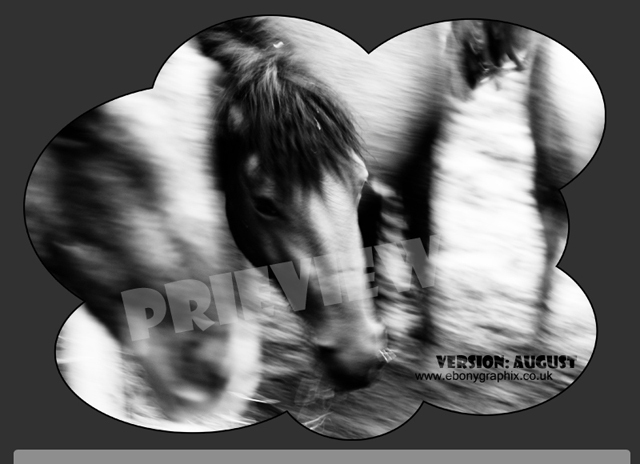 Today I have completed and uploaded a brand new free horse layout for everyone to use if they so wish. This layout is known as August 2010 Theme and is in a greyscale style. If you would like to use the brand new layout feel free to do so via the "Free Horse Layouts" section of the site. It will be the one at the top of the page. I have also made a slight update to the top of the layout list page it will allow you to show and/or hide the tip box at the top just in case you have a small monitor and wish to see more of the layouts at the top of the list. Today I have updated the MyStable.co.uk help section which gives hints and tips to playing the game and includes how to get FREE CREDITS Please click on the "Horse Games" section and click the link to MyStable Help to view the page! Today I have added some more help for players of the online game HorseIsle and included lots of information on how to work out uts and much more. Its well worth a look. I have also tweeked the layout list page by adding a link to the updated HorseIsle help section at the top and moved down the donation button to underneith the layouts. I am in the process of creating a new layout for August and I hope that you will like my new creation check back soon and I will get the new layout up and running asap... just need to finish it first. Firstly I would like to appologise for the downtime which some users may have experienced when viewing the website on 20th July 2010 - 21st July 2010. The issue has now been resolved and the game is fully back up and running. I would like to inform everyone who views EbonyGraphix that additional updates have been made to the "Personal Layout Generator" which now repositions the layout code provided so its in full view when your personal layout code is created. I have also updated the personal layout form which is used to create your personal layout so that it remembers the last details entered so you dont have to re-type everything back in if you wish to edit your personal layout. As you may or have may not noticed I have edited the fonts which are viewed on EbonyGraphix which I hope will make it easier for you kind visitors to view the codes of the layouts and hopefully make it a little easier when reading the website. please click here to view the HorseIsle Guide. Brand New Layout - June! Well today I have created and enabled a brand spanking new layout known as June 2010. It features a bay mare and foal running around their enclosure and a fabulous expanding text area for you to write your content into, I hope you like it! Today I have added two new layouts! These are known as Barrels of Fun and Compassion they are listed at the top of the free layouts section so please check them out! Today I have been busy updating the "Name Generator" it seems some small minded person has decided to think they are smart and entered some very offensive content through the name generator, that person has now had their network connection blocked from accessing this site since I dont think that other people should have to deal with one retards mental issues. Harsh but fair as some people may say. I do thank everyone else who has participated in entering some really great and extraordinary names into the name generator its a great help and benefit to all other users of this site! I would also like to inform that I have added a "Facebook Like" button to the top of EbonyGraphix when we have 100 different people liking this site... I will add a special surprise for all visitors of EbonyGraphix to use! Today there has been another new free horse layout added to the free layouts section this one is known as "Winners Circle" I hope that you will like this fantastic new layout! Please feel free to send me your comments or questions through the help / support section. Also the help / support section has been updated, I have had to add a slick new verification box to help prevent bots from spamming my email address which is very annoying. I have also added the contact form to the top of the help section you you can find it easier! Today I have added another game to the "Horse Games" section, its known as Riding Club Championships and is quite a cool PC Horse game which has on-line aspects where you can compete against other players on-line. More information, videos, screen-shots and link is available in the "Horse Games" section. Click Here to view the horse games section. Well its been a while since I have added to the Horse Games section, I have added a cool new review for the new horse game "Mary King 2: Riding School" which is a Wii Game. There are some cool new screen shots and even the official trailer for the game which is a great addition. If you like what you see please purchase the game from the game page as all money raised will go towards keeping EbonyGraphix online for another month. Please be aware that you may experience some downtime of EbonyGraphix today/tonight as I have to upgrade the server which this site is hosted. Well today has been a lovely day with warm weather and still winds a great day for grazing ones Guinea Pigs. I hope you have been enjoying the warming spring weather! I would like to wish everyone a Happy Easter weekend and I hope that you get lots of easter eggs... unfortunatly for myself the easter bunny once again forgot to visit myself. Nevermind... maybe 3 years on the trott he wont forget me! The past few days have been getting warmer and the weather has been more mild than ever for many months. However a massive storm raged yesterday and the icy northern wind and driving rain, sleet and snow was ample throughout most of the day. Today however is a calm and bright day very much the opposite of what was happerning yesterday. Hopefully summer will be rolling on forward and nice warm weather will be forcated and followed! I am happy to announce that the "Gypsy Vanner Version 2" has been finalized and is now ready for use. I hope that you will enjoy using the layout as its very pretty and has a striking and bold statement. Thank you to the person who sumitted the image to our old gallery which gave us permission to use the image in a layout. Well not a lot has been going on in the world of EbonyGraphix, a little birdy tells me that some online horse games featuring in our games sections will be updating in the next few weeks. Its been a fast tranistion from winter to spring with more and more warm sunny days happening every day now. Animals can be kept outside more frequently. I would like to inform all the users of EbonyGraphix that I will not be updating the site within the next 7 days the simple reason for this is because I will not have internet connection on my computer during that period of time due to premesis location change. This will not effect the connectivity of the webiste and it will be live as normal. I will however still be able to answer questions that you may have with the website but this may take a few days longer than normal but not guarenteed, as I will be answering emails through my Blackberry SmartPhone. (a smartphone is a important asset to any business or website owner). I hope that this has kept you in the loop and aware of what is happening at the moment. I hope you enjoy using EbonyGraphix and as normal if you have any comments, suggestions or questions please feel free to contact me. I have added further questions and answers to the help section relating to software tutorials as I dont believe that it was made very clear that I do not give tutorials on how to use software or create HTML layouts / pages through them. I hope the help section now clarifies this a bit better. Remember I am here to help so if you have any comments, suggestions or questions about EbonyGraphix or my work please do not hesitate to contact me through the contact & help section. Today I have added another free layout known as the Retirement Account layout, its quite nice and features a few horses on a brown background nothing spectacular but its still very nice to look at. I have also been working on updating the Horse Name Generator to make sure that it only allows text and spaces as some people have been trying to be funny by entering brackets and numbers as names. Well thats what I get for not being thorouh. A new section has been added to the admin allowing me to delete any innapropriate names which may have slipped through the safety filter and I have made a remove news button allowing me to remove news and then add new content if I so wish. Every little helps as Tesco say. Today I have been a busy bee and updated the home page to view the latest news dynamically and also view the last six updated pre-designed horse layouts. Further security updates have been done on the layout ist page. It doesnt sound much but its taken a good few hours to add this to the system. Five more free pre-designed horse layouts added and a slight tweak to the layout list has been made. The latest layouts to be added are the Winter Theme, Woodland Wonder, Straight Egyptian Arabian, Painted Perfection and Saddlebred. I hope you will like them. They are easy to find at the top of the layout list. The layout list now orders the layouts by latest update so you will always see the most recently updated layouts first! For most of yesterday I was optimizing EbonyGraphix for the search engines and tidying up the new design code. You wont see any change on the front end but google is going to give us good marks on it. bonyGraphix xhtml is as fully optimized as possible and the validator has passed the website. In the next few days I will be validating and updating the css of the website this shouldnt take more than a hour or two at the most so hopefully I can manage a couple more of the offline layouts when I have time. I will also be adding a blog or latest news section to the site so you can stay updated. EbonyGraphix 2010 - New Design! I am happy to announce that EbonyGraphix™ has had its yearly makeover I hope you like the crisp new look of EbonyGraphix™. Your comments, feedback and suggestions are apprechiated. As prior announced the site will be offline for a few hours while I upgrade the systems and overall site design. All is on schedule for tomorrow. I have scheduled an update for EbonyGraphix on Thursday 4th February 2010. Each year I try to re-design the website to suit the yearly trends and hopefully add new features which will give the visitors more of a reason to come back. This time round we will be featuring less on the clutter and more on the content and making it look nice and easy to navigate. The navigation will be a little different all the main categories will be a the top but if you go right to the bottom of any page you will find a navigation panel which will take you directly to all the special features and useful tips and hints that you desire. New in 2010 is the return of the “Horse Name Generator” which had to make a speedy disappearance due to security issues which have now been resolved. However the visitors will have to fill out the name generator full of wonderful horse names, there have been a few placed to start everyone off. Along with this I have added some new sections including “Horse Game Help” which covers the popular online horse games “Howrse”, “MyStable” and “HorseIsle”. Hopefully you will find something interesting in there to read about and aid you when playing. I have focused on those three games as those are the only ones which I play myself at this time and therefore know most about. I will not recommend any games which I have not and do not play. Members of EbonyGraphix will get an added bonus when the new version of EbonyGraphix is released, if you are not a member then sorry this will not be available to you, however it is very worthwhile and is in the value of £6.00 GBP. Additional features include video tutorials for drawing horses in various programs and even by hand, which gives you an idea of how to create your own designs. Obviously horse layouts, horse game reviews, and the personal layout generator will remain on the site for everyone to use as intended. There is so much more to offer everyone and I hope that when it is released on Thursday you will enjoy the new look website. Five new layouts have been added to the free section making a total of 50 free pre-designed horse layouts for you to use. Remember if there isnt one there you like please create a membership account and create your own unlimited personal layouts!